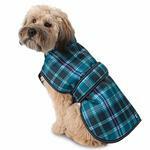 This high-quality Kodiak Dog Coat in Teal Plaid is great for chilly pups! The Kodiak Dog Coat by PetRageous is a great coat for any pup! Made of hi-tech Epoch Breathe-Comfort polyester material produced to be water-proof and wind-proof, yet breathable and comfortable. Full-coverage belly, lightly padded for warmth, lined in black polyester. Reflective tape sewn on binding edges. The attractive two-tone teal plaid exterior has a turn up collar to protect neck. Leash hole for convenience. Full-coverage belly is belted is fastened with adjustable thick touch fastener® strap around belly girth. Elastic leg straps for an extra secure fit. Kodiak Dog Coat - Teal Plaid Customer Photos - Send us your photo! Charleigh is a rescue dog and had lost of her hair coat due to neglect. With winter coming she need a blanket that would cover her under belly and chest. This blanket is a wonderful fit and is comfortable for her to wear. It is completely dry even after running thru the snow. Awesome blanket. I think the website is absolutely adorable. Very well done!